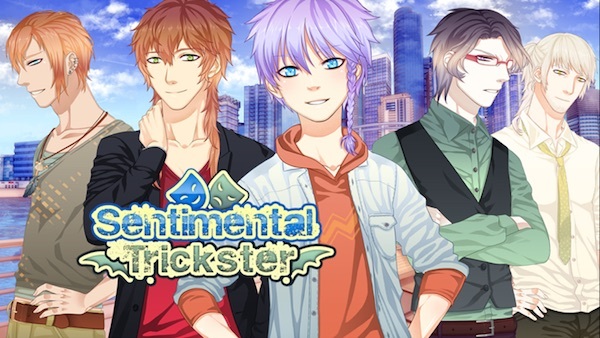 It’s always exciting to see a new BL game in the works, and Sentimental Trickster is no different. This ages 18+ visual novel has already hit its initial funding goal on Kickstarter and is successfully Greenlit, but with additional support could reach some exciting stretch goals such as more CGs, sprites, and facial animations, or even a new dateable character! Sentimental Trickster follows protagonist Haru as he sets off to start a new life at arts college and comes in contact with a plethora of hunky men (some more friendly than others!). There’s a demo of the first hour or so of the game available for Windows, Mac, and Linux on the Kickstarter page, which I highly recommend checking out. The game so far has been made entirely by a single person, and it’s extremely impressive, to say the least! At the time of this post, the Kickstarter has 7 days left until it ends, which means there’s still plenty of time to get in on some of the exclusive extras such as a playable Kickstarter-exclusive “thank you” from the characters themselves. Since the game has already been fully funded, there’s no fear of the disappointment that comes with backing a campaign with an uncertain outcome. I look forward to seeing the completed version of Sentimental Trickster in March 2017!